Gennaro Gattuso says he does not know whether he will be retained as AC Milan coach amid continued speculation over his future. Arsene Wenger dismissed reports he could take charge of the Rossoneri as "fake news" this week, with former Arsenal chief executive Ivan Gazidis having switched to San Siro. 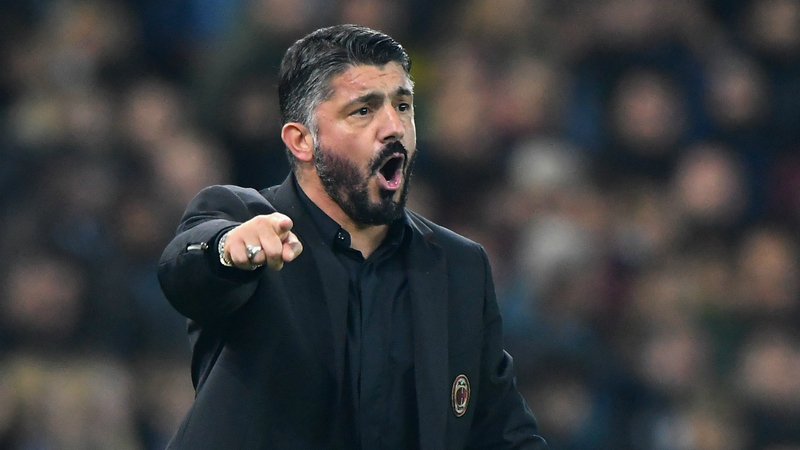 Gattuso's position has appeared insecure ever since his appointment but Milan have found form of late, winning five of their last six Serie A games to climb to fourth in the league. Milan host leaders Juventus on Sunday with on-loan striker Gonzalo Higuain facing a race to be passed fit to face his parent club. And Gattuso said questions about his Milan future should instead be directed towards sporting director Leonardo, but he feels the team is backing him to continue. "You have to ask Leonardo as per this aspect," Gattuso told a news conference. "The club will make their decisions when it is time. "I was always the last to know their decisions this summer season and it's only fair that those who are in charge make their necessary decisions. "All the injuries and problems we had made the team come together and regroup, now my boys do everything I ask, I see the fire in their eyes that I like, the cohesion and the desire to be together." Cristiano Ronaldo has scored five goals in his last six appearances for the Serie A champions but Gattuso backed Franck Kessie to help keep the superstar quiet at San Siro on Sunday. "I think we have Kessie in our team, he can stop Cristiano," Gattuso added. "You can stop him with good organisation. They also have [Juan] Cuadrado so we will have a lot of work on our hands. "Who says that there is a fixed lineup? It is true that I have used the same players lately, but this moment has strengthened us even more. We need the perfect performance in order to beat Juventus tomorrow. "Juventus are full of champions, they are very strong in all aspects. Manchester United had to play at their maximum to beat them, together with Barcelona the Bianconeri are among the top teams in Europe. Ronaldo is an added value for them." Gattuso was asked about the controversial celebrations of Manchester United manager Jose Mourinho at the end of his side's Champions League victory over Juventus. Inter coach Luciano Spalletti has defended Mourinho, who won the treble during his time in charge of the Nerazzurri, and Gattuso also backed the Portuguese. "I have done even worse, imagine if now I start to say what Mourinho can or cannot do," Gattuso said. "Spalletti is right in this aspect, don't disturb the sleeping lion. We all receive offenses, it is not for me to judge."